Click on each year below for more images and stories. In my father’s attic I found an old copy of the “Counselor,” the blue handbook that all NNHS eighth graders received in Guidance Class. you don’t, here they are. I sent the copy of the Counselor to the NNHS “archivist,” Fred Mays ('60 - of VA). Here are the cheers I copied from the Counselor. 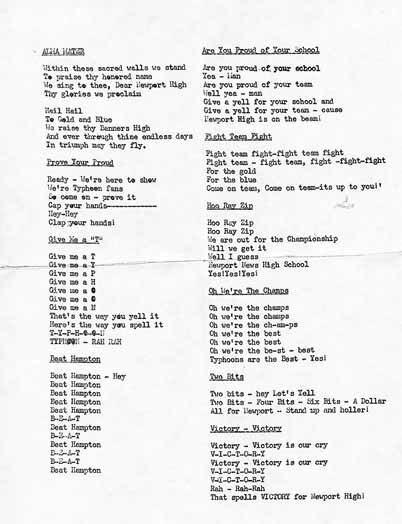 These were the cheers that we used when I was a student at NNHS 1954-1959. Bang on the tin can. Newport News High School is always on top! Us got a team that’s red hot. Maury High ain’t going very far. Come on Newport, Turn on the heat! How do you like your oysters? How do you like your cabbage? How do you like your sugar? How do you like Hampton? The Captain lowers his head. You gotta fight, fight, fight." All you people in the stands. 'Cause Maury High is gonna get beat! In the July 18th newsletter Glenn Dye ('60) of TX asked about some of the cheers we used to do at ball games and pep rallies. I remember two that were not listed in Susan Whitcomb Harlin's ('72 - of TX) list. The first was Two bits, four bits, six bits a dollar, all for Newport stand up and holler. Then we would jump up and scream like crazy. Then there was one that was only used for games with arch-rival Hampton High. It went like this: Crush the Crabbers, Crush the Crabbers, Crush the Crabbers rah! There may have been a second line to this cheer but to the best of my recollection, this one line was simply repeated over and over again. Of course then the Hampton student body would respond with their own cheer: You can't crush a crab, you can't crush a crab, you can fight and fight with all your might but you can't crush a crab! Unfortunately during the annual Turkey Day Classic, they were usually right. In the 1951/52 school year (my first year at NNHS), we came into the game with an impressive 7-2 record but HHS beat us 48-0 and ruined a pretty good season. Actually, they beat us every year I was at NNHS except one and that ended in a tie. But we did make up for it in basketball.